320 pages | 6 x 9 | 5 illus. This can be compared with another story, this time from a Muslim milieu. A renowned 12th century Shī‘ī genealogist by the name of Muḥammad ibn al-As‘ad al-Jawwānī visited Aleppo. He was met by a local man, sharīf Idrīs ibn al-Ḥasan al-Idrīsī. The latter sought public confirmation of his distinguished lineage. The title he bore, sharīf, indicates his claim to be an ‘Alid, a direct descendant of the Prophet’s grandson al-Ḥasan ibn ‘Alī. Al-Jawwānī, it turns out, was unconvinced by his genealogical claims, and far from verifying his lineage, discredited him, viewing him as a genealogical pretender. These two stories together, which Franklin discusses in his book, encapsulate, to my mind, its main premise. This is a book that demonstrates the value of distinguished (Davidic) lineage in medieval Near Eastern Jewish society. Furthermore, it reveals the extent to which it parallels developments in Muslim society. Franklin, in his well-written and attractively produced volume, changes the way we perceive Near Eastern Jewish society in the Middle Ages. The shift he urges is conceptual. He reveals the centrality of genealogy to a society that we thought had long since preferred alternative criteria for social and political advancement. His argument is compelling. Covering a large swath of time – some five centuries, Franklin thoughtfully guides his reader through a sometimes unfamiliar world. The source material sustaining this study is mostly documents drawn from the Cairo Geniza. Typically, these are not the redacted editions of the study house, but rather jottings, lists, panegyric poems, letter-drafts, and personal copies of satirical broadsheets. They are inscribed in the animated ebb and flow of daily life, in the midst of political struggles and for the cause of aspiring egos. The book includes five main chapters, a handful of images, and two appendices. The first appendix provides the source and translation of Halper 462, one of the more interesting genealogies; and the second lists the biographical details of 107 Davidic dynasts datable between 950 – 1450 CE. Franklin’s first chapter outlines a genealogical shift that occurred in Jewish society. By the tenth century Jews and, indeed, Muslims, had come to view the Davidic family as distinguished by its noble ancestry. This was a Jewish resonance of the importance of ancestry in Arab-Islamic society in general, and in particular, of the special status acquired by members of Muḥammad’s family. There is a pre-Islamic rabbinic legacy but its evolution in medieval society is not predictable. While there were Jewish leaders in the pre-Muslim era who claimed Davidic descent and enjoyed a degree of distinction as a result, the role played by Davidic descent in the Muslim era was quantitatively and qualitatively different. Rabbinic sources do not deal with demonstrating the veracity of Davidic lineage claims, but now we encounter attempts to provide a chain of lineage to prove the connection to biblical forebears in the form of detailed and complete genealogical lists. In the Muslim period the social value of Davidic lineage expanded. In the pre-Islamic era, Davidic lineage claims were tied to particular authority structures within the Jewish community — the exilarchate and the patriarchate — but with the rise of Islam this no longer obtained. While the exilarchate (the exclusive domain of the House of David) continued, we now find the term nesi’im to be used in this period for members of the Davidic clan. Many nesi’im had positions of authority, yet most such communal offices were not formally limited to members of the Davidic clan. Furthermore there was a numerical growth. The nesi’im are a group, al-ṭā’ifa al-dāwūdiyya, (the Davidic faction). There was also a geographical development: the Davidic faction began to expand westward by the tenth century, no longer being confined to Babylonia and its environs. On the whole, Franklin’s book is more interested in the shoots of David — the nesi’im — than in the trunk — the Baghdad-based exilarchate. The second chapter describes the public display of ancestry and the need to demonstrate a complete pedigree. Thus it delves deeper into the evolution of these genealogical lists. The earliest list, according to Franklin, is the Aramaic Seder ‘olam zuṭa. He shows how lists of “exilarchal rule” evolved into more individualized genealogies of Davidic families. One way was to reverse the order, starting not with the biblical ancestor but with the current incumbent and working backwards. Such genealogical lists, consisting of many dozens of names, might be appended to a signature or a letter. Priests, Levites, and others also produced detailed pedigree lists. Indeed, Franklin observes that “Davidic genealogies were part of a much broader preoccupation with biblical ancestry in Jewish society”. The public performance of genealogy might involve a poem composed in honour of an individual, where reference would be made to members of the biblical line of David, thereby putting into poetry what the lists accomplished in prose. These lists, that took the incumbent as far back as possible, are also a model that was central to Islamic society’s construction of Muḥammad. The Muslim lists came first, and like Jewish ones, would typically result in a round number, such as forty of fifty generations to the critical biblical personage. The sources reveal the central role that genealogy played in communal struggles over authority that need have had nothing to do with lineage. Whether it is the right to determine the religious calendar or leadership over the Geonic academies, both ostensibly academic pursuits, the arguments offered in support of one candidate or to denigrate another invariably would focus on ancestry. And yet the ‘House of David’ was not alone at the pinnacle of medieval Jewish society. It was more of a diarchy than a monarchy. Priests, the “sons of Aaron”, contend with equal energy, and indeed no less success, in staking their claim to privilege. Most of the sources described in this chapter, in fact, portray priests and Davidic dynasts in some manner of political conflict. Franklin observes how the contemporary “political disputes could be conceptualized as rivalries between biblical dynasties”. The tenth century Karaite exegete Yefet ben ‘Eli would observe that ancient genealogies dating back to biblical times are only found with “the priests and the kings” (i.e. Davidic dynasts). This, he says, “is on account of their nobility among the Jewish people”. Each of these two lineage-nobility groups makes similar claims, and manipulates both biblical verses and rabbinic sources to assert its exclusive right to leadership and to undermine the other. This distinctive form of medieval mud-slinging is a reminder of the unique character of the material available from the Cairo Geniza and the vivid portrait of society that it allows. It makes for entertaining reading. Was the covenant between God and the House of David eternal or had it been nullified already in antiquity? One is accused of being a descendant of proselytes; a priest of being the “son of gravediggers”. Is a member of the Davidic dynasty to be compared to David and Solomon, or perhaps to Ahaz and Manasseh. They can be particularly creative. One author has combed the classical rabbinic sources for the entire register of denigrating judgements against priests. These are presented in 24 stanzas, evoking the 24 priestly courses which traditionally served in the temple. It focuses on the genealogical blemishes indicated by certain unbecoming behaviour traits but it is actually the product of a quarrel between two priestly clans over the leadership of the Palestinian yeshiva. A composition in the style of the epic seder ‘avoda liturgical poem begins as expected only to dramatically switch midway to glorify Judah and his descendants in place of Aaron. This poem co-opts the classical liturgical locus for the elevation of the priesthood, and was actually composed by a somewhat unscrupulous priest. Not only does one find Davidic dynasts usurping the priesthood’s seder‘avoda genre for their cause, but also developing their own association with the Jerusalem Temple, more typically seen as an exclusively priestly domain. On the other hand, one curious story about the Karaite Solomon ha-kohen, a man of priestly descent, suggests that the pendulum might swing the other way too. He would appear to have been appropriating the messianic role that is associated with the House of David when he claimed that he was the Messiah. His assertion greatly puzzled our informant on this messianic pretender, Obadiah the Norman proselyte, who met him in 1121 CE. The fourth chapter explores messianism as a backdrop to Near Eastern Jewish society’s profound interest in the descendants of King David. The prevalence of Davidic dynasts offered rich soil for the flowering of messianic sentiments and actions. While earlier scholars have recognized the heavily messianic rhetoric which infuses Near Eastern medieval Jewish discourse, it has not yet been linked to the families who actually claimed Davidic descent. 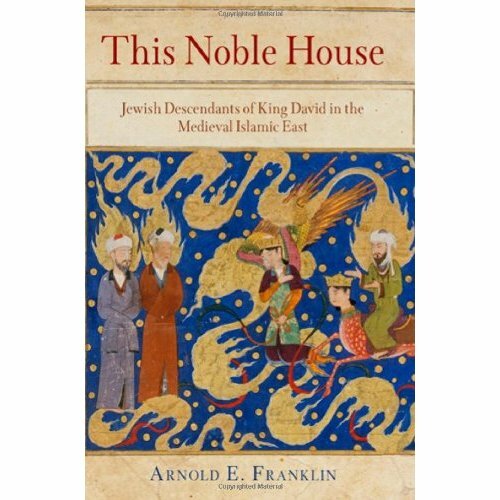 Here Franklin provides a succinct and informative overview of messianic themes in Near Eastern medieval Jewish society. An intense anticipation of the advent of the messianic era is reflected in religious, legal, liturgical, and popular literature of the times, and also in the active efforts to predict its arrival. Much of this finds an outlet in active messianic agitation, pretenders and heralds, who appear and stir up political troubles that threaten to overturn the delicate position of the Jews in the Muslim world. Here, too, there is a vital Islamic context to be addressed: Islamic traditions on the mahdī, a saviour figure, usually held to stem from the Prophet’s family. The Jews often employ the very same terms of reference for their redeemer as the Muslims do for their own. One naturally wonders about the relationship between such messianic feelings and the nesi’im who were so overtly identified with the family of David. Were the heightened messianic feelings intensified by the visibility of such mortals possessing the required genealogical credentials, and were such hopes pinned directly on specific individuals? Indeed, as Franklin observes, one does occasionally encounter messianic hopes affixed to prominent figures. They appear as rhetorical flourishes in letters and more explicitly in panegyric works. Furthermore, opponents were concerned that people might associate messianic possibility with actual political contenders. They sought to pre-empt and undermine such claims. The Judeo-Arabic Bustanay satire demonstrates the contamination of the Bustanay line from which almost all members of the Davidic dynasty claimed descent. Another approach asserts that the messiah was already born on the day when Jerusalem was destroyed. By situating the actual messiah in the mythical past, this approach aimed to neutralize messianic excitement attached to contemporary members of the Davidic line. Notwithstanding such concerns there is no evidence of nesi’im being involved in messianic agitation. They revelled in the glory of the past and in the latent future promise, but presumably were cautious enough not to gamble their present position of honour for an uncertain hope. In the final chapter Franklin broadens the discussion to encompass the claims to distinguished genealogy among non-Arab peoples living within the Muslim orbit. He argues that in its concern with biblical lineage medieval Jews in the Near East were “participating in a process of redefinition that affected other minority groups in the Islamic world as well.” Indeed all “embraced nasab as a way of laying claim to legitimacy.” Christians could also have been added here. For instance, patriarchal lists for the eastern Syriac church emerge in this period and Bagratuni Armenians claim Davidic descent. Some stressed the existence of a class of nobles in every people. Others fabricated a distinguished Arab nasab, or such that improved on them. Persians claimed descent from Isaac (a claim aimed to evoke the slave origins of the Arabs descended through Hagar); Berbers sought Ansari or Himyar descent. Still others asserted no less distinguished lineage among the non-Arab nations. Of particular interest were the claims to Persian historical or mythical figures from the pre-Islamic past. Thus we encounter members of the landed nobility, dehqans, and other dynasts claiming descent from Sasanian kings. Typically the claims were not supported by detailed lists of descendants, but in at least one case, for the Būyids, al-Bīrūnī provides a list of 14 generations linking the incumbent to the Sasanian king Warahrān Gūr. Davidic descendants were a source of national pride for the Jews as a whole. They derived a kind of “collective, vicarious legitimization from the biblical lineages we have been documenting”. We encounter enthusiasm for biblical lineages by those with little or nothing to gain from them. Jews sought proximity to Davidic dynasts and welcomed their visits. This pride was refracted off the Muslims. It was important how the Muslims related to them. As Benjamin of Tudela points out, the exilarch was greeted by the Muslims in Baghdad with the cry: “make way for our lord, the son of David”. In this way the Jews experienced “a kind of collective ennoblement through their proximity to members of their own noble, pure, and prophetic lineage”. One reservation that I have relates to the place of the priests in this picture. As Franklin fully recognises, in communal politics they shared centre-stage with the Davidic dynasty. But in the scheme of this book they have been largely consigned to the margins. Furthermore, the continuity from pre-Islamic times is a little more pronounced with respect to the priesthood than Franklin explains. Polemical contestation between Davidic dynasts and priests appears in the post-Mishnaic rabbinic literature. Jewish society also seems have been cultivating a preference for priestly lineage in its communal leadership offices and elsewhere already in the pre-Islamic era. Although Franklin has preferred a monarchical model, focusing on the pre-eminence of the Davidic line in imitation of the ‘Alids, the fundamentally diarchical character of Jewish politics deserves more consideration. In sum, this erudite and highly readable volume is impressive in its mastery and exposition of such diverse and complex sources. More significantly, in its genealogical shift it makes a vital contribution to our understanding of Near Eastern medieval Jewish society, and particularly to our appreciation of the depth of the Jewish-Arab symbiosis. One can now add to his analysis my own discussion on seder ‘olam zuṭa in A Prince without a Kingdom, The Exilarch in the Sasanian Era, Mohr Siebeck, Texts and Studies in Ancient Judaism 150, Tübingen, 2012, 261–299. Franklin, This Noble House, 177. I presented a paper on this topic at the Association of Jewish Studies annual conference in Boston in December, 2010, entitled, “Patriarchs, Priests and Purity in Amoraic Palestine”. I am preparing it for publication. For Babylonia see Herman, A Prince without a Kingdom, 231–236. G. Herman, “Priests and Amoraic Leadership in Sasanian Babylonia”, Proceedings of the Twelfth World Congress of Jewish Studies, Division B, History of the Jewish People, Jerusalem, 2000, 59–68. The predominance of priests in the leadership of the Babylonian academies is suggested by the data provided in Sherira Gaon’s epistle. See Herman, “Priests and Amoraic Leadership”, esp. 64. This entry was posted on April 5, 2013, 3:20 pm and is filed under Book. You can follow any responses to this entry through RSS 2.0. You can leave a response, or trackback from your own site.